display of risk results as point risk estimates, maximum fenceline risk, f-N curves, and risk contours. Top level objective: To analyze the risks associated with bringing a new high-toxic-hazard material on-site, or with modifying an existing process that involves the handling of such material. Factors addressed: Specifics of the process, including process parameters, layout, piping, instrumentation, test intervals, inventories, detection and isolation features, and secondary containment; site-specific data, including meteorology and topography; population data, including locations, indoor/outdoor fractions, and sheltering provisions; material characteristics, including toxicity, volatility, and warning properties. Technical bases: (1) Identifying loss event scenarios; i.e., abnormal situations that could result in loss of containment of the material of concern. (2) Estimating the likelihood of occurrence of each scenario, based on a combination of process experience (where available), published industry data, and calculated reliability measures for safeguards. The structure of the scenario elements as entered into the risk model allows automatic calculation of overall scenario frequencies. 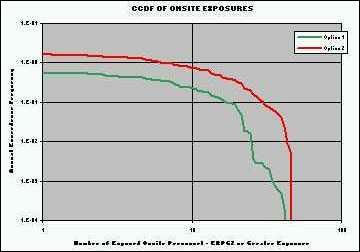 (3) Determining best-estimate values of the number of persons exposed to the ERPG-2 vapor concentration, taking into account the full range and associated probabilities of meteorological conditions, the typical geographic distribution of onsite personnel, offsite demographic distribution data, and appropriate credit for sheltering and other emergency response actions. (4) Appropriately combining likelihoods and severities to obtain the specified risk measures. Implementation: The entire risk model is implemented in Excel® with repetitive calculations to obtain consequence severity measures. Integrated worksheets define and document basic events, scenarios and source terms, populations of concern, consequence measures, and risk results. Analysis process: (1) Define scope, endpoints, and risk measures. (2) Tailor the eToxQRA model to the specific study objectives and expected data limitations. (3) Identify loss-of-containment scenarios, including release detection and mitigation measures, generally as a team approach. (4) Incorporate the scenarios into the risk model, while defining the source term parameters for each scenario. (5) Estimate cause frequencies and conditional probabilities using process experience, component counts, and human error rate estimates. (6) Enter population and meteorological data and calculate consequence severities. (7) At this stage, risk measures are automatically calculated, and the risk model is complete and ready for review and for studying variations from the base-case system. Optimization: Contributions to the total risk can be sorted at the basic event, scenario, release bin, and/or process segment level, to identify the greatest risk contributors. This allows the targeting of risk-reduction measures where they will do the most good. Risk-benefit analyses are often conducted at this stage, to identify the design and operational changes that will give the greatest risk-reduction benefit for the least cost.